Elegant and aggressive, Maxum's flagship sport yacht commands instant attention. The sweeping sophisticated style is uniquely Maxum. She rides on a solid fiberglass hull with moderate beam and a shallow keel for stability. 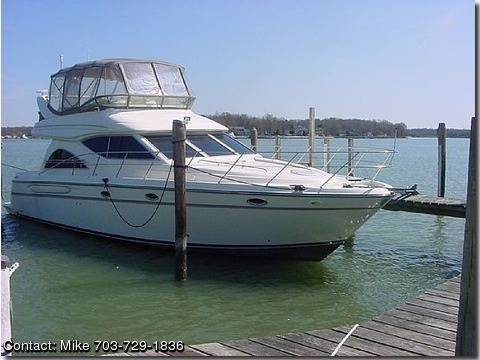 This yacht has been very well maintained by her present owner who bought her new and is absolutely turn key. Seller is motivated- shown by appointment only. Entrance to the elegant salon is through a curved glass sliding door. On the port side you have a entertainment center and forward of that is the very spacious galley. On the starboard side is the salon area with a U- shaped ultra-leather sofa and table and forward of that is the dinette area. Indulgence and glamour greets you at the salon door with the cherry wood cabinetry, soft stylish curves, courian countertops and ultra-leather lounges and soffets. The master stateroom is forward and epitomizes luxury with a queen sized centerline bed, full headroom and ambient lighting. On each side there is a hanging locker that is cedar lined and illuminated. Aft to port is the master head with a large shower/tub with an acrylic enclosure. The guest stateroom and head are located aft of the master stateroom on the starboard side. The stateroom has 2 berths and with a center filler cushion that converts to a king size berth. The guest head is forward on the starboard side and has a stall shower and a Vacu-flush head. At the helm, command comes from a mahogany wheel and an impressive array of instrumentation positioned for maximun visibility and appeal. The L-shaped lounge provides comfortable space for you and your guests, with storage underneath. A fully functional entertainment center is conveniently located on the bridge and features a molded in sink and faucet.